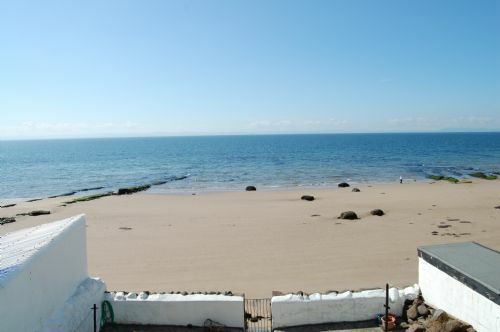 Rockhopper Cottage is a gem of a little cottage situated right on the beach with direct access from the patio. Apart from the panoramic sea views the cottage has to offer, it has recently been modernised inside to provide all the comforts of home with tasteful bright and fresh decor and furnishings. There are two bedrooms, - the master bedroom (can be a superking or two singles) has stunning sea views and you will wake up in the morning to the sound, smell and view of the sea from your bed. The ground floor has been thoughtfully furnished with comfy seating, modern galley kitchen, table and chairs next to the patio doors which again look out to sea. From here you can access a small South sea facing patio and grassy lawn with steps down to the beach. For cosy winters there is a focal point around gas stove which looks just like a real wood burner without the hard work!! With the beach on your doorstep this is an ideal base for families, couples seeking a romantic break and dog walkers alike. A well behaved dog is permitted on the ground floor. The local pub is just a few hundred yards away serving good local fayre, and within a radius of a few miles there are a wealth of other great restaurants and cafes to choose from. There is a local shop in the village. The historic town of St Andrews is just a 20 minute drive, and equally close are all the beautiful fishing villages along the East Neuk coastline which all have their individual character. Living Room (open plan with kitchen) - view of sea, patio doors with direct access to patio, comfy seating, tv with DVD, gas effect traditional style stove, table and chairs, the sofa can convert to a bed for occasional guests. 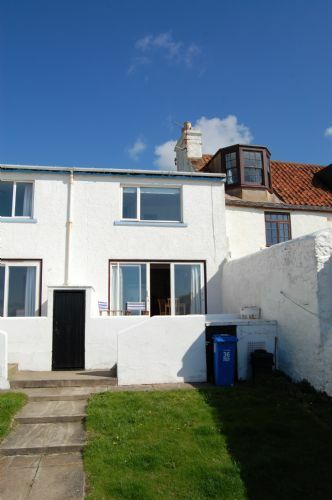 Access via patio doors from sitting room is a small patio area overlooking the beach and sea. A few steps then lead down to a small grassed area. From here is a gate with step leading down to the beach. The lawn directly in front of the cottage, the washing line and an outside fresh water tap (which can be invaluable for wetsuits) belongs to the cottage. The steps down to the beach are shared. 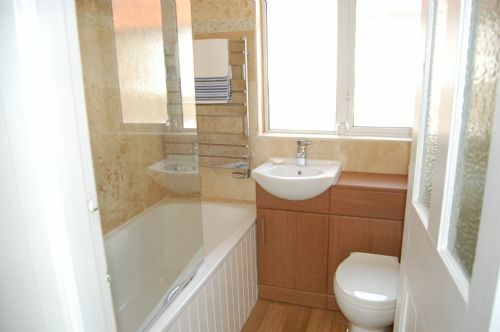 All rentals include the provision of bed linen, towels, tea towels, bath mats. Please bring your own beach towels. NOTE the patio and garden are on two levels separated by a few steps, therefore toddlers would need to be supervised. 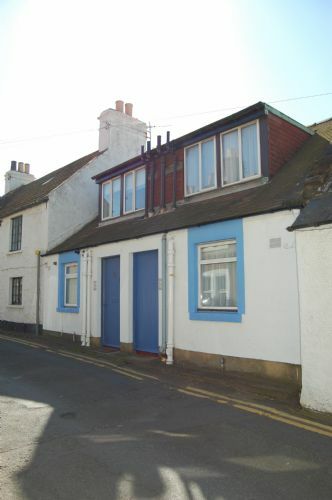 Lovely cottage with stunning views of the bay. Very comfortable and well appointed. Thank you. I enjoyed watching the TV and looking at the wonderful view. Great cottage and great location. We have all had a great time and hope to be back soon. What a marvellous cottage. Very well appointed. You have everything for the perfect holiday. We have enjoyed each day and the changing seascape. Going home with fond memories. Hope to be back for another week. Lovely week cottage in a great spot. Well equipped kitchen. Nice touches throughout. Fluffy blankets went down well. It was a joy to sit on the beach adn soak up the October sun. Cottage was a wee piece of heaven on earth. Will definitely book again. Had a fantastic week here in thie wee gem if a cottage. Most relaxing holiday we've had for a while! Weather was fantastic hot every day. Looking out you would think you were on the med. I will definitely book again. Cottage fab.....everything you need. We were very lucky with the weather so couldn't ask for anything else. No neighbours so the dog had the run of the garden. Hope to be back next year. Once again we had a fantastic holiday - hope to return again next year. We thoroughly enjoyed our stay at the cottage and were really pleased with the standard of decoration and equipment. we had a fantastic time. The cottage is a real haven and the beach is fantastic. Thanks again. We loved Rockhopper Cottage, the view was fantastic and a very welcome change from Glasgow!!! !